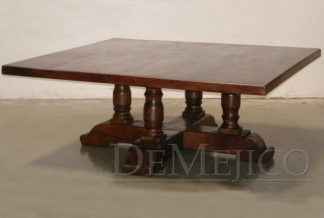 The Mesquite Oaxaca Buffet is a grand piece, brand new to our Dining Room Catalog. Hand crafted from solid mesquite wood, and accented by hand forged iron hardware, this carved buffet features a great deal of Spanish style. Grabbing your attention, three large cabinets each adorned with intricately hand carved detailing are the focal point of this buffet. Finished off with hand forged wrought iron accents and hardware, this Spanish buffet table is the perfect addition to your large dining room or entertainment space. See this buffet in old wood, here.